Imagine awe over discovering fantastic vistas in The Last Frontier. Imagine exhilaration while exploring the wilds of Alaska. Imagine relaxation upon finding your slice of paradise in The Caribbean. Imagine Bliss. Thats what you’ll experience when you vacation on our newest and most incredible ship, Norwegian Bliss. Custom-built for the spectacular, Norwegian Bliss features a revolutionary Observation Lounge for you to soak in every stunning moment, from bald eagles soaring over glaciers to dolphins splashing through warm turquoise waters. Whether you choose to go tropical or a little wild, theres one word to describe the experiences awaiting you on Norwegians newest ship: Bliss. How do you get on board? Between May and September discover the panoramic and rugged Alaskan coastline with Norwegian Bliss and her cruises in Alaska. With cruises departing from the convenient American port of Seattle, these seven-night round-trip itineraries can visit Juneau, Skagway, as well as captivating ice formations including Sawyer Glacier and Tracy’s Arm Fjord. For those seeking a warmer experience, plan your holiday between November and March when Norwegian Bliss is hopping between the tropical islands of the Caribbean. Norwegian Bliss’ Caribbean itineraries are seven-night cruises from Miami visiting the US Virgin Islands, British Virgin Islands, and Nassau, while you can cruise to the Bahamas from New York. If you can’t make it all the way to the west coast, why not discover the Mexican Riviera aboard Norwegian Bliss on one of her seven-night cruises from Los Angeles. Why not tick two items off your bucket list – a cruise on Norwegian Bliss and a Panama Canal transit! Be quick, with only 2 cruises a year these Norwegian Bliss Panama Canal voyages are sure to fill up quick! Enjoy FREE PERKS* when you book on the Free at Sea sale. Pick one perk for inside cabins, three for oceanview and balcony and receive all perks if you book in a suite*. Choose from included drinks*, dining*, wifi* or shore excursion credit*. View International Free at Sea Sale. $10pp deposits* when you book a cruise departing after 10 Sept 19 by 30 April. View $10pp deposit cruises. 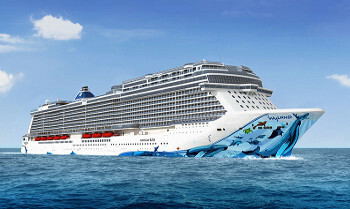 View all Norwegian Bliss cruises, view a selection of Norwegian cruise deals, or view more options for the Norwegian Cruise Line. Please note: All Norwegian Cruise Line departures within the next 30 days are not currently bookable online. To make a booking, view all scheduled last minute Norwegian Bliss sailings and then call us on 13 13 03 or request a callback during business hours and a member of our team will be to assist with pricing, availability and to make a booking. We apologise for any inconvenience. Experience a quarter-mile wraparound oceanfront promenade that allows you to connect with the ocean while experiencing some of our signature venues like Ocean Blue, Cagney’s Steakhouse and Sugarcane Mojito Bar. This is cruising. Revolutionized. Follow your mood from one amazing experience to the next at the heart of the ship – 678 Ocean Place. Three decks of non-stop action await you, day or night. Rock out at The District Brew House. Get lucky in the casino or let your palate do the picking at one of our specialty or main dining restaurants. Our award-winning casino offers plenty of thrilling casino games for every type of player, whether you’re a beginner or regular at the poker table. Find your lucky seat at one of our many slot machines and in our non-smoking area. Or play in the big leagues with any number of table games. No matter what you prefer, theres always a way for you to get lucky. Guests of The Haven can recline and unwind in the exclusive, plush Horizon Lounge located on Decks 17 and 18. The two-story, forward facing observation lounge offers The Haven guests breathtaking panoramic views. Experience sheer awe from our 180-degree indoor Observation Lounge – offering Norwegian’s most expansive views at sea. More than 3,500 square feet of floor-to-ceiling windows provide spectacular vistas while cruising past snow-capped mountains. Take time to relax with a complimentary bite to eat morning, noon and night. Interactive screens will help identify every incredible view, whether the glaciers of Alaska or the pristine beaches of The Caribbean. And with a full-service bar, you can toast colorful sunsets with your favorite cocktail. There are plenty of ways to be pampered. Unwind in the Thermal Suite with a steam or a dip in the Vitality Pool. Check out the Salt Room and chill out in our Snow Room. Or simply indulge in a hot-stone massage. Treat yourself. You deserve it. Top off spectacular days with legendary nights aboard Norwegian Bliss. Spend an evening in a swinging speakeasy on the eve of Prohibition. Perfect your dance moves and clear your pipes as you go on an incredible audible journey with The Four Seasons in a Tony Award-winning musical. Fans of the Beatles shouldn’t miss a night rocking out in the famous Liverpool nightclub where the band played. Which will be your soundtrack to an unforgettable night? “Oh, What A Night” is not only a hit song by The Four Seasons but also what you’ll be saying after an evening at the blockbuster musical, Jersey Boys. Journey from the gritty streets of Jersey to glamour and international fame as you follow the incredible true story of Frankie Valli and The Four Seasons. The band will rock your night with their timeless songs that include \”Big Girls Don’t Cry,\” \”Walk Like A Man\” and \”Can’t Take My Eyes Off You.\” Too good to be true? Not if you’re cruising aboard Norwegian Bliss! Pull up a chair in the legendary Liverpool club where the Beatles performed. Sip your Scotch Sour during an evening of good company and great music with a Beatles cover band. This is your ticket to ride down Penny Lane, perhaps in a Yellow Submarine. Don’t wish you’d experienced the magic yesterday. Come together tonight and get back to the groovy days with Norwegian. Travel back in time to January 16, 1919 – the eve of the Prohibition era – for a rip roaring good time with the interactive show, Happy Hour Prohibition – The Musical. Set in world famous Madam Lulu’s New Orleans speakeasy, tantalizing madams will regale you with tales of bootleggers and some of the era’s most famous tunes that will have you dancing in the aisles. Savor five of your own Prohibition Era specialty cocktails, each with a modern twist, while enjoying an unforgettable night with Miss Lulu and her girls. A great night out always includes laughter and good friends. So you can bet on an awesome time at Social Norwegian’s upscale venue that flows from comedy club to night club. Jump start the evening with two talented stand-up comedians that will loosen you up with lots of laughs. And then let loose on the dance floor as a DJ spins your favorite tracks late into the night. Come on by Coco’s because anytime is a good time to savor some chocolate. With savory chocolate pralines, crepes, coffees and more types of divine treats than days of your cruise, Coco’s is the sweetest spot in 678 Ocean Place. Warm up for your glacier walk with a Caramel Macchiato. Grab a Teavana Shaken Iced Green Tea Lemonade to sip while lounging on a pristine Caribbean beach. Or recount the day’s excitement with your friends over Chai Lattes and a scone. Come on by Starbucks to make your vacation even sweeter. What better way to add to an exhilarating ocean walk along The Waterfront than with a delicious scoop of gelato? With so many flavors to choose from, all made fresh onboard, you may want to make it a double. Indulge your sweet tooth with decadent treats available a la carte, such as French macarons, chocolate pralines and cupcakes. Pull up a stool and take a Merlot for a swirl as you laugh with some of your closest friends. Pair your favorite vintage with some light bites from La Cucina, or elevate your wine IQ with programs meant for experts and novices alike at the Tasting Table. For four generations, the Mondavi name has been intimately linked with prestige winemaking in Napa Valley. And now, they’re bringing their best blends and unparalleled knowledge to The Cellars A Michael Mondavi Family Wine Bar. Hit the jackpot in more ways than one at Skyline Bar. Nestle into plush interiors and take in the changing view. Our high-definition digital landscapes illuminate this cocktail lounge with ever changing moods. It’s the perfect spot to have a cocktail before dinner, meet friends after the show or just press your luck with bar-top poker screens that give winning at the bar a whole new meaning. Freshly muddled just the way you like, enjoy a refreshing mojito with friends day or night. Settle in with your friends beside floor-to-ceiling windows and order one of more than 50 different bottled beers or any of the 24 draft beers on tap. Toast another awesome day with specialty cocktails. Scream your lungs out alongside live music. Or get a little wild inside the photo booth. What happens in The District, stays in The District. Sit starboard, right alongside the sea where the view is intoxicating. Good times flow indoors, too. With a unique international variety of spirits, you can sip your way around the world without leaving your chair. The Local offers classic Pub fare in a relaxed pub atmosphere 24 hours a day. With popular dishes like Chicken Pot Pie and Fish n’ Chips to daily dinner specials like Prime Rib, The Local has all your favorite comfort foods. So try a few of the many beers and catch a game on the two-story TV screen. Between Los Lobos and Cagney’s Steakhouse, The A-List Bar is the perfect spot to be the center of attention or simply be at the center of it all. Named after one of our famous A-listers, Andy Stuart, President & CEO of Norwegian Cruise Line, The A-List Bar will shake up the night with hand-crafted margaritas and a seriously good time. Cocktails and conversations are always stirring at this hip modern bar located between Taste and Savor. Meet up for drinks with friends before dinner or swing by after to listen to some live piano. Mixx is the place to be seen! Inspired by the renowned summer beach parties on the island of Ibiza, Spice H20 is an adult-only escape. By day, you can soak in hot tubs or sip cold cocktails from your reclined lounge chair. By night, it’s a whole different beat. Let loose and dance beneath the stars as vibrant images display on the huge video screen. Bring your favorite whiskey cocktail from Maltings into Humidor to pair with a good smoke. With comfortable leather chairs and a fully-stocked humidor, this is the ideal setting to recline and connect with friends, both new and old. We know a thing or two about letting the good times roll for everyone. And with our interactive Kids’ Aqua Park and fleetwide complimentary youth programs – Splash Academy and Entourage – there’s excitement for all ages on board. Hosted by an Early Years Coordinator, Guppies is perfect to for Norwegian’s youngest guests. Enjoy up to two hours a day of interactive parent-child activities, including sensory play, painting and more. Your little ones will have a blast inside Splash Academy where they can enjoy creative play, sports and more. From themed activities to parties, our youth staff has a knack for this stuff. Or drop off the kids during supervised Group Sitting on port days or in the evening and make it a romantic night out. Movies. Art. Music. Video games. Dance parties. Welcome to Entourage a retreat for teens looking to have fun and hang out with people their own age. One thing’s for sure: absolutely, positively, no parents allowed. Slide into the time of your life. With two multistory waterslides on board, Norwegian Bliss let’s you rush to adventure over and over again. Make it the best of three on Aqua Racer, our tandem waterslide at sea. And then get a thrill as you whoosh over the side of the ship on the double loop, Ocean Loops. Or call it a lazy day and lounge by the pools and hot tubs with a frozen drink in hand. However you like to make a splash, the Aqua Park is overflowing with excitement. See the ocean blur by as you take hairpin turns on the largest racetrack at sea. Get ready for a thrilling ride on this two-level competitive track while putting your driving skills to the test. Blue skies above and turquoise waters below! Human colonizers have lost contact with Planet Earth. It’s up to you to find them while searching an abandoned spaceship in this fast-action experience at sea. Whether friends or family are joining you on this mission, the fate of the world is in your hands. Balancing classic favorites with unique new dishes, dining at Savor is a must. Offering guests an extensive menu of deliciously fresh flavors along with chic and modern decor, visiting this Main Dining Room is always in style. Whatever you’re craving, chances are you will find it at the Garden Cafe. This complimentary, indoor restaurant serves up breakfast, lunch and dinner and the floor-to-ceiling windows provide picturesque ocean views. In addition to a variety of entrees and side dishes, you’ll find our popular action stations featuring made-to-order omelets and waffles, an Italian pasta station, a carving station with freshly prepared meats sliced to your liking, grilled specialties, ethnic favorites, and a dessert area lined with sweet surprises. One of three Main Dining Rooms aboard Norwegian Bliss, The Manhattan Room is where guests can dance in style while listening to live music and enjoying specially curated modern and classic dishes made with the freshest ingredients. Savor an exclusive array of dishes for breakfast, lunch and dinner in a private restaurant serving the finest cuisine. Enjoy stunning vistas indoors or al fresco. Serving a wide variety of cuisine, Taste also offers a stylish and contemporary atmosphere. Plus, with a menu that changes daily, Chef’s Signature Dishes and carefully selected wine recommendations, you’ll experience a different culinary adventure with every visit to this Main Dining Room. Smoked over hickory, oak and pecan wood, all our meats are infused with delicious flavors whether ribs, chicken or brisket. Tap your cowboy boots to the beat of live country music and dig into some authentic Texas BBQ. Whether cruising Alaska or the tropics, you’re only a short walk away from the smokehouse. Tastefully nautical and temptingly delicious, Ocean Blue is not to be missed for seafood lovers. Whether dining inside or oceanside on The Waterfront, enjoy fantastic vistas and fresh, locally-sourced seafood. Cruising Alaska? Savor fresh Alaska salmon. Island hopping The Caribbean? Scoop up some flavorful ceviche or grilled snapper. Add a little local flavor to your day at Ocean Blue. Enjoy the flavors of the Tuscan countryside al fresco alongside the sea, or indoors at tables with room for old friends and new. Dine on classic dishes where you can taste the freshness of every tomato used to make an exquisitely delicious sauce. Try a twist on a classic like lobster fettuccine, or keep it purist with a pasta carbonara. Just when you think you’re out, they’ll pull you back in with a toasty espresso and some macadamia nut ice cream. Delizioso! Travel somewhere new with every delicious bite at Food Republic. Savor a fusion of foods and cultures from around the globe. Travel to Peru to scoop up some ceviche. Jet away to Japan and try a new kind of sushi roll, or have a hearty helping of noodles from China. With a variety of familiar favorites and unique additions from around the globe, you can travel the world without ever leaving the ship. Your lost shaker of salt is right here in Jimmy Buffett’s Margaritaville at Sea. Savor signature items like the Cheeseburger in Paradise. Sip on a Who’s to Blame Margarita. Or sit back and groove along to island-inspired live music at this a la carte dining venue. Inspired by the lyrics and lifestyle of Jimmy Buffett, this isn’t just a restaurant. It’s a state of mind. Steak is the standard at our American-style steakhouse. Pull up a seat along The Waterfront and take your pick from premium cuts. Your mouth will water, so sip your favorite cocktail in anticipation. And don’t forget to order our made-from-scratch jumbo crab cakes and a side of our famous truffle fries. Romance is in the air at our signature French restaurant situated toward the top of the ship among floor-to-ceiling windows offering spectacular views. Elegant interiors, crisp white linens and attentive servers make this an intimate dining experience. By the end of your meal, you might just be proclaiming c’est magnifique!